Last weekend I decided that I was going to make soup. Bryan loves the Quinoa and Spinach Soup from my first cookbook, but I was not really in the mood for that particular soup. I was thinking more along the lines of chicken noodle soup. 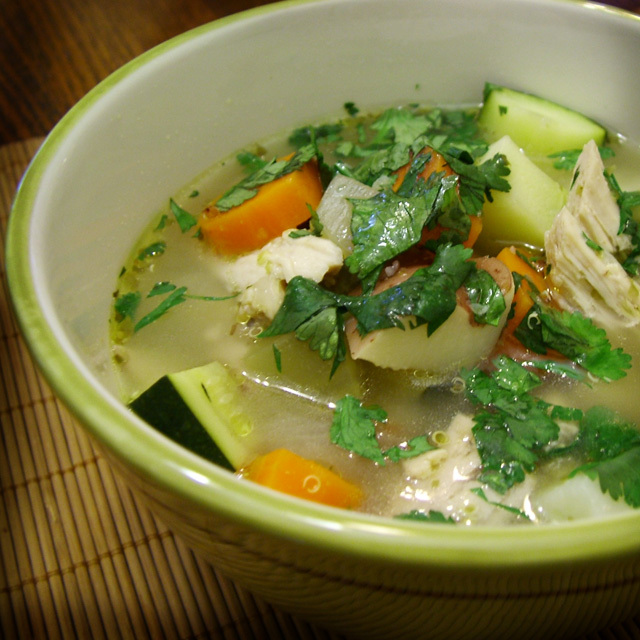 To satisfy both of us, I suggested that I make a soup inspired by the flavors of Peru. I’d have the yummy chicken soup aspect that I was after and Bryan would have the quinoa that he apparently was craving. Sometimes I think this act of finding the middle ground is why we’ve been together for almost 20 years. The soup turned out fantastic, if I do say so myself, and is now on our list of favorites. Quinoa (pronounced keen-wa) is the seed of the goosefoot plant, prized by the ancient Incas. It is a complete protein and a good source of the amino acids. Quinoa is also gluten free. If you can’t find aji amarillo, a yellow pepper with medium heat that has been dried and ground, then use 1 tablespoon of fresh jalapeño pepper that has been finely minced. When you make this recipe, it is best to prep all the ingredients before you start to cook. We like to serve it with grilled flatbread or fresh cornbread. Place the quinoa in a fine sieve under running water for about 3 minutes or until the water runs clear. Let the quinoa drain after rinsing. Toast the quinoa in a dry frying pan, preferably non-stick, over medium heat until the seeds start to jump or pop in the pan. Remove the seeds from the pan and set aside. Heat the oil in a large heavy pot or Dutch oven, over medium heat. Sauté the onion and celery until softened but not browned. Add the garlic, aji amarillo or jalapeño pepper, cumin, and oregano. Stir for 1 minute being careful not to scorch the garlic. Add the chicken, salt, water, potatoes, and quinoa. Bring the mixture to a boil, then reduce the heat to medium and simmer for 20 minutes. Skim off foam, if desired. Remove the chicken and set aside. Add the carrots to the pot and let simmer for 15 minutes. While the carrots are cooking, remove the chicken meat from the bones and shred using two forks. Discard the bones. Add the zucchini and lime or lemon juice to the pot. Continue to simmer for 7 to 10 minutes and add the chicken meat back to the pot. Heat the chicken through and season with salt and pepper to taste. Garnish each bowl with fresh cilantro before serving.